Shop local and handmade: That’s the advice of the Friends of the Chester County Library (CCL), which is sponsoring CCL’s 3rd Annual Craft Fair on Saturday, Dec.14. From 10 a.m. to 4 p.m., vendors will be stationed throughout the main Exton library as well as in the Struble meeting room. Craft- makers will include a variety of jewelers, knit and fabric artists, a local coffee artisan, and many more. Some of the vendors will be demonstrating their craft, so visitors can get ideas for their own projects. 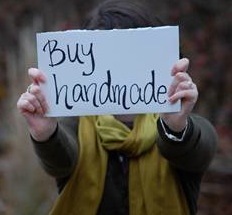 Purchasing handcrafted gifts for loved ones shows that you care about quality as well as the recipient. For those inspired to make gifts themselves, the library has several new books on craft techniques. Tie-dyed shirts with extraordinary patterns can be found in Tie-Dye: Dye It, Wear It, Share It, and a new DVD on jewelry-making techniques is Beads Baubles and Jewels: Thinking Like a Designer. For more information, visit the library’s web site http://www.ccls.org and view the events calendar, or contact Kristen Cassidy at kcassidy@ccls.org.